Wind energy is another form of renewable energy which is available in abundant and is renewable. So, there will always be constant supply of it. The initial cost to set up wind energy is very high and requires huge initial investment, but once it starts working, it is one of the cheapest form of electricity to maintain. In some states in the U.S., residents can buy wind power through their electricity provider. This makes it easier for the average person to access this valuable resource. Below are few facts that many of you don’t know. So, just have a look at them and see how wind energy can become as the major source of power generation if it is harnessed up to it’s potential. 1. 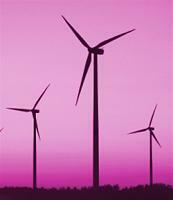 Wind energy is a form of solar energy which is caused by sun’s heating of the earth’s surface. The use of wind energy is growing rapidly because it is abundant, cheap, clean, widely available and environment friendly. 2. The wind turbines effectiveness depends on the location where they are placed. Ideally, wind turbines should be located where there are constant flow of wind throughout the year. 3. U.S, Germany, India, France, U.K, Spain, China, Italy, Denmark and Portugal are the top ten nations where wind turbines are used most efficiently. 5. Most of the households across U.S. and U.K. take advantage of wind energy and have installed varied amount of small wind turbines to power their homes and to cut the electricity bills. 6. In the year 2005 wind energy accounted for less than 1% of the total electricity production in the world. In 2008, it was estimated about 1-2% of the world ‘s energy supply comes from wind energy source. 7. Wind energy approximately cost $1 million per megawatt to install and one megawatt of wind energy is enough to light up to 250-300 households. 8. The earliest known use of wind power is by the Egyptians some 5000 years ago, who used it to sail their boats from shore to shore on the Nile. 9. Wind turbines are relatively quiet. Improved engineering and appropriate setback from homes mitigates noise issues. At the appropriate setback from homes, a wind turbine makes the sound equivalent of a common kitchen refrigerator. 10. The opposition usually met from a proposed wind farm development comes down to the “NIMBY” factor (not in my backyard). Next articleWhat is Wind Energy and How Does Wind Turbine Work?